A proton is a positively charged subatomic particle found within the atomic nucleus of atoms. The number of protons in the atomic nucleus is the one that determines the atomic number of an element, as indicated in the periodic table of the elements. The proton has +1 charge (or, alternatively, 1,602 x 10-19 coulombs), exactly the opposite of the -1 charge contained in the electron. In mass, however, there is no competition – the mass of the proton is approximately 1,836 times greater than that of an electron. The proton is classified as baryon, and is composed of three quarks (uud). The corresponding antiparticle, the antiproton, has the same characteristics as the proton but with a negative electrical charge. The protons were identified and characterized by the 1920s, but their size and mass were learned until 1954, and their composition was known until the 1960s and 1970s. Proton comes from a Greek word meaning”first”. It is a subatomic particle with a positive electrical charge which, together with the neutrons, forms the nucleus of the atoms. The atomic number of the proton determines the chemical properties of that atom. The proton we have to make it clear that it was discovered in the early part of the 20th century by the scientist Ernest Rutherford. Specifically, it was in 1918 that the existence of this element was made known. However, other figures who addressed this issue are J.J. Thompson or Eugene Goldstein. Protons are composed of three quarks of 1/2 spin. Protons are classified as baryons which are a subtype of hadrons. The two quarks above and one quark below the protons are held together by strong nuclear interaction. The proton has a positive charge distribution and declines exponentially. Protons and neutrons are nucleons. Both are united in the core by a strong nuclear force. The most common isotope of hydrogen is a nucleus with a proton. The nuclei of the heavy hydrogen isotopes (deuterium and tritium) contain one proton and one or two neutrons, respectively. These two hydrogen isotopes are used as nuclear fuel in nuclear fusion reactions. All other types of atoms are composed of two or more protons and different numbers of neutrons. The number of protons in the nucleus of an atom determines its chemical properties and, therefore, the chemical element is represented by the number of protons in a nucleus (Z). To determine the isotopes of an element, the number of neutrons (N) is also used by adding all the nucleons together and is known as the mass number (A). According to the stream of proton particle physics experiments, the proton is a stable particle, which means that it does not disintegrate into other particles and, therefore, within the experimental limits, its life is eternal. This point is summarized in the conservation of the number of baryons in the processes between elementary particles. In fact, the lightest baryon is precisely the proton and, if the baryon number is to be stored, it cannot fall into any other lighter particle. The proton is extremely small. To make an analogy: if a hydrogen atom were to grow to the size of your bedroom, the proton would be the size of a particle of dust that you can barely see, i.e. the diameter of a proton is 100,000 times smaller than the diameter of a hydrogen atom. The diameter of the Sun is only 3000 times smaller than the distance traveled through the solar system, so a hydrogen atom is actually emptier than the solar system itself. The inside of a proton can be described as pure chaos. Millions and millions of quarks, antiquarks, and gluons move at almost the speed of light within a proton, so it is impossible to describe its internal structure in simple words because it is completely disorganized. Mass and organization calculations are now calculated using supercomputers are even controversial, due to the complexity they present. Protons are one of the concepts we learn from elementary physics, but they tell us little about their composition or behavior. 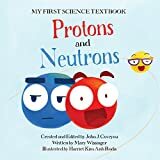 A proton defines the atomic number of an element and each element has its own atomic number, so all elements have a unique number of protons. The antiproton is the antiparticle of the proton. It is also known as a negative proton. It differs from proton in that its charge is negative and it is not part of the atomic nuclei. The antiproton is stable in a vacuum and does not disintegrate spontaneously. However, when an antiproton collides with a proton, both particles are transformed into mesons, whose half-life is extremely short (see Radioactivity). Laboratory, by Emilio Segré and Owen Chamberlain, for which it was awarded the Nobel Prize in Physics in 1959. In 1886, Eugen Goldstein discovered anodic rays and demonstrated that they were positively charged particles (ions) produced from the gases. When varying the gases inside the tubes, Goldstein observed that these particles had different values of charge to mass ratios. For this reason, the positive charge could not be identified with a particle, unlike the negative charges of electrons discovered by Joseph John Thomson. After the discovery of the atomic nucleus by Ernest Rutherford in 1911, Antonius Van den Broek proposed that the place of each element of the periodic table (its atomic number) was equal to its nuclear charge. This theory was confirmed experimentally by Henry Moseley in 1913 using X-ray spectra. In 1917, Rutherford demonstrated that the hydrogen nucleus was present in other nuclei, a general result described as the discovery of the proton. Rutherford realized that by bombarding alpha particles in pure nitrogen gas, his scintillation detectors showed signs of hydrogen nuclei. Rutherford determined that hydrogen could only come from nitrogen and therefore should contain hydrogen nuclei. A hydrogen nucleus was disintegrated by the impact of the alpha particle and formed an oxygen atom -17 in the process. The hydrogen nucleus is therefore present in other nuclei as an elementary particle, what Rutherford called the proton, after the singular neutral of the Greek word for’first’, πρῶτον. Protons have an intrinsic spin. This property is used in nuclear magnetic resonance (NMR) spectroscopy. In this technique, a magnetic field is applied to a substance to detect the crust around the protons in the nuclei of the substance, which are provided by the clouds of adjacent electrons. This information can then be used to reconstruct the molecular structure of a molecule under study; it is still called a proton in any type of link you want to establish. Therefore, the mass of an atom is concentrated almost exclusively in its nucleus. The proton has an intrinsic angular momentum, or spin, and therefore a magnetic momentum. On the other hand, the proton complies with the exclusion principle. The atomic number of an element indicates the number of protons in its nucleus and determines which element it is. In nuclear physics, the proton is used as a projectile in large accelerators to bombard nuclei to produce fundamental particles. 2. What is the Atomic Bomb? 3. What is the UN? 5. ¿ Qué es la lluvia radiactiva ?